Juan Diego was a poor Aztec Indian and devout Christian who lived in the Mexican village of Tolpetlac. Juan and his wife were childless and, after she died, his only companion was an old uncle who had raised him. Juan had little want for anything but the few vegetables which grew on his small farm. On Saturdays and Sundays, he would start out before dawn for a larger village a few miles away where the Franciscan priest would say Mass for him and the other peasants who came from nearby villages. En route to Mass on the Sunday following the Feast of the Immaculate Conception, (December 8), Juan followed his usual route which took him over Tepeyac Hill. As he approached the top of this hill, Juan heard beautiful music and, the sounds of birds, although on this cold, wintry day, there were no birds around. Juan then heard a voice calling him by name. When he looked up, Juan saw a beautiful lady wearing a sky-blue veil and a dress the color of roses. Juan recognized at once that this was Mary, the Mother of God. Mary told Juan that she had a special errand for him. He was to go to the bishop of Mexico City and tell him that she wanted a chapel built on this hill for all who seek her aid. Juan immediately set off for Mexico City and, after waiting many hours, was allowed to see the bishop. He relayed Mary’s request to the skeptical bishop, then left to return to his village, downcast because he had failed to convince the bishop that Mary had indeed spoken to him. As he came by Tepeyac Hill on his way home, once again Our Lady appeared to Juan. He protested that he was not worthy to carry out her mission, but Mary told him to return to the bishop the next day and repeat the request. So Juan again went to Mexico City and told his story to the bishop. This time, the bishop found it difficult to believe that this simple man could be making up such a tale. But, to be sure, he asked Juan for a sign that this was really a request from the Mother of God. Juan returned to the hill and told Mary of the bishop’s request. Mary told Juan to return the next morning for a sign. But when Juan returned to his village, he learned that his uncle was suffering from a high fever. Juan spent all night and the next day with his uncle, but his uncle’s condition did not improve. Indeed, Juan thought that his uncle would soon die. Leaving his uncle in the care of a neighbor, Juan set out for the Franciscan mission to have one of the priests bring the last sacraments to the dying man. When he reached the foot of Tepeyac Hill, Juan decided to avoid another meeting and so took a winding path around the hill. But as he was rounding the hill, Juan saw the Blessed Mother coming toward him. Standing in front of him, she asked him why he was taking this route. Juan, in tears, told her of his uncle’s illness and how he had to bring a priest. Mary smiled in understanding, but told Juan not to worry, that his uncle was already cured and strong. She told Juan to go to the top of the hill and gather an armful of roses. Juan set off on this heavenly task knowing that he would find the flowers. (Roses did not bloom in Mexico in December and certainly not on that hill which was covered in cactus.) He gathered as many of the roses as he could carry and took them to the Lady. She, in turn, told him to bring the roses to the bishop, assuring him that, this time, he would be believed. Juan put the roses in his tilma (a woolen cloak) and set off to see the bishop. When he unwrapped the roses from the tilma, they fell to the floor as fresh with the morning dew as when they were picked. But this was not what caught the bishop’s attention. On Juan’s tilma was the image of Our Lady just as Juan had seen her on the hill. When Juan, anxious to see his uncle, finally returned to his village, the old man and the other villagers came out to greet him. His uncle told him that his fever had mysteriously gone away and that the Blessed Mother had then appeared to him and told him of Juan’s errand. She also told Juan’s uncle that, henceforth, she was to be known as Holy Mary of Guadalupe, Ever-Virgin. When the chapel was built, Juan Diego was assigned by the bishop to guard it. His tilma was displayed there in a place of honor, where it remains to this day. A magnificent basilica now stands on the spot where the chapel was first built. After more than 400 years, the garment, with its vision of our Lady of Guadalupe, is as fresh and unmarred as it was on the day the bishop first saw it. Pope John Paul II canonized this saint on July 31, 2002 at the Basilica of Our Lady of Guadalupe. 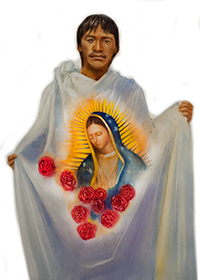 Saint Juan Diego is honored by the Church with a memorial on December 9, the date of his first vision. Juan’s message today: Although Juan was a man of very simple means, he was not afraid to speak to the bishop when emboldened by Mary’s request. Our faith can help us to speak boldly as well, whether it be in the name of justice or simply to help someone in need. Who or what needs your boldly spoken words right now?